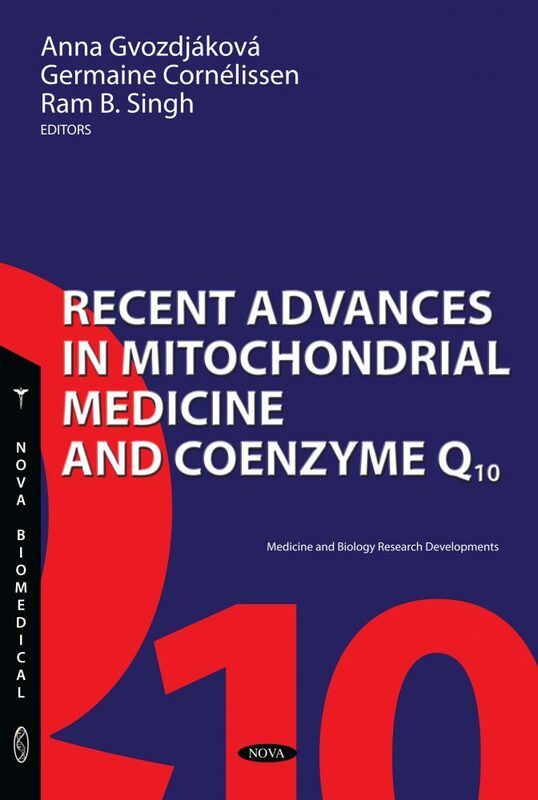 Recent Advances in Mitochondrial Medicine and Coenzyme Q10 (eds. Anna Gvozdjáková, Germaine Cornélissen, Ram B Singh) is an updated version of a book Mitochondrial Medicine (ed. A. Gvozdjáková) published by Springer, The Netherlands, in 2008.
International contributors and world specialists in Mitochondrial Medicine and Coenzyme Q10 provide up-to-date knowledge in mitochondrial physiology, and review the role played by mitochondria in relation to diseases, diagnosies and therapies pertinent to various fields of medicine. This monograph covers topics related to mitochondrial physiology, mitochondrial sirtuins, supercomplexes, chronobiology, epigenetics, genetics, neurology, cardiology, nephrology, immunology, diabetology, oncology, and reproductive medicine. A chapter on the history of coenzyme Q10 focuses on the work of Prof. Frederick L Crane, discoverer of coenzyme Q10, who died in 2015. Current diagnostic methods of mitochondrial disturbances are reviewed, including a new non-invasive approach using high-resolution respirometry in human blood cells. The effectiveness of supplementary therapies of mitochondrial disturbances is examined for the case of natural antioxidants, melatonin, high protein diet, omega-3-PUFA, omega-6-PUFA, natural mineral water sources and polarized light. Targeting mitochondrial therapy involves coenzyme Q10 (ubiquinone, ubiquinol), prospective mitochondrial replacement therapy and mitochondrial transplantation. This book is intended for general medical practitioners and specialists in various fields of medicine, including neurologists, cardiologists, geneticists, nephrologists, diabetologists, lipidologists, immunologists, oncologists, pharmacists, biochemists and nutritionists. Pre- and post-graduate education physicians, pharmacists and biochemists will also benefit from material covered in this monograph. This book is intended for general medical practitioners and specialists in various fields of medicine, including neurologists, cardiologists, geneticists, nephrologists, diabetologists, lipidologists, immunologists, oncologists, pharmacists, pharmacologists, biochemists and nutritionists. Pre- and post-graduate education physicians, pharmacists and biochemists will also benefit from materials covered in this monograph.